Maxine McDonald, 83, died Thursday, June 2, 2016 at Bryan LGH east in Lincoln. Funeral Service Monday, June 6, 2016, 2:00 P.M.
Visitation Sunday 3 to 5 p.m.
Maxine Daisy McDonald was born June 25, 1932, to Henry and Mabel(Potter) Mais, on the family farm near Bellwood, the youngest of three children. On January 23, 1948, she married Gerald W. McDonald in Schuyler. They were married for 68 years. They lived their entire lives in Bellwood and were the parents of three children; Leroy Gerald, Gerald W., Jr. and Linda. Maxine worked for Farmers Coop Grain Company of Bellwood for over 37 years, retiring in 1994. 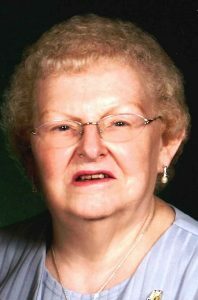 She was a very active member of the Bellwood Methodist Church for over 50 years, serving on the church board and in many other capacities, including the United Methodist Women's group. She was also a member of the American Legion Auxiliary and the DUV. Maxine had served on the Bellwood Village Board and was a member of the Bellwood Senior Citizens Club. She enjoyed cooking ,reading and caring for her plants and flowers. In their younger years, she and Gerald enjoyed camping and fishing and she loved caring for her pets. She was very proud of her grandchildren and great-grandchildren. Maxine is survived by her children; Gerald W.(Terry) McDonald, Jr., Linda(Ernest) Polacek, all of Bellwood, six grandchildren;Denyse, Leroy Jr., Chad McDonald, Tanya(McDonald) Kovar, Jerimy McDonald and Jayson Polacek and five great-grandchildren;Mychael, Nycholas and Jasmyne McDonald, Alexis Polacek and Jemma McDonald. She was preceded in death by her parents, husband Gerald W. McDonald, Sr. on April 1, 2016, son Leroy G.McDonald, brother Garland Mais, sister Lillian Benedict and two grandsons.